We headed to the northern region of Ghana today. After a short flight and a broken down bus, we made it safely to the Tamale Teaching Hospital and were fortunate enough to meet with Dr. Ken Sagoe, CEO of the hospital. He spoke to us about initiatives by different groups to address cleft palate and expressed the need for speech language pathologists and other rehabilitative professionals in Ghana. He also talked about how there needs to be a shift from groups that come to Ghana, repair clefts, and leave, to groups that train Ghanaian surgeons instead. This would be better for the post-surgical care of patients, and would allow more cleft patients to be served. Dr. Sagoe mentioned that at this point in time, 3 surigical missions were still coming to Tamale between June and December this year: June, The Graft Foundation (from within Ghana), July, Operation Smile and September, a team of Ghanaian doctors abroad in Britain and British doctors. Finally, Dr. Sagoe answered some of our questions about the hospital. One of the biggest issues is retention. In previous years, 50% of doctors who were trained at the hospital left the country, most finding work in the U.S. and the U.K., but now they are able to retain more doctors through incentives and salary raises. Dr. Sagoe stands out as the driving force behind the changing retention rates and intitiave-based programs helping to reverse them. His tenure has also seen increasing numbers of health care providers to graduate from Tamale’s Medical and Nursing Schools, as well as the implementation of updated trainings, professional development, and protocols for staff, despite being in a region with no internet. 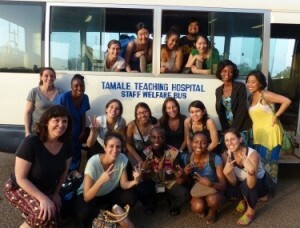 After our meeting, Esther, one of the Public Relations staff, took us on a tour of the hospital. First, we went to the maternity ward where a nurse told us that they have about 30 to 50 births each day. Then we were able to go in the Neonatal Intensive Care Unit (NICU) where we saw little babies struggling to breathe and survive. It was really heart-wrenching. We then made our way to the radiology department where they proudly showed us their advanced equipment, including a fluoroscopy machine, which could be used for modified barium swallows- a procedure that SLPs deal with frequently. We also saw a building under construction which Esther told us was going to be a new location for the entire NICU scheduled to open up in September this year. It was a great experience seeing all this development. Later in the evening, one of our supervisors, Erika Cardamone, who is an SLP in a NICU, gave us a thorough and informative lecture on the role of the SLP in a NICU. We spent time thinking of recommendations we could give to help improve the care of the babies in the unit, such as promoting sidelying elevated positioning, assessing the baby for feeding readiness, and kangaroo care, where the mother puts the baby to her chest. The hospital is continuing to make developments in its care and we are hopeful that the new unit will be very helpful.